When a crowd packed into a public hearing of the Copake Planning Board in early October, opponents characterized a proposal for a new gas station and convenience store as a project that would overwhelm the tiny hamlet of Craryville. The development, critics warned, would be one of the largest gas stations in Columbia County, with enough pavement to accommodate 12 fueling stations and 48 parking spaces spread out across the 1.7-acre lot at Craryville’s main intersection. By the end of the month, however, developers announced that they were making major changes to the proposal, including greatly reducing the store’s parking area, in response to local residents’ concerns – and also because of recent changes to the town’s zoning law. Whether the changes represent a victory for the project’s opponents and local smart-growth advocates will start to become clear on Dec. 6, when the developer’s revised plans are scheduled to be unveiled at another Planning Board meeting. 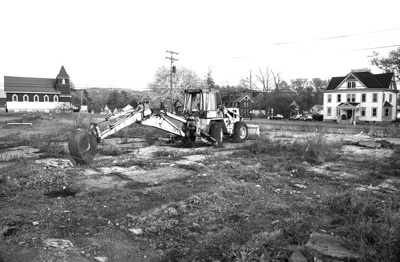 But the controversy in Craryville offers lessons for other towns in Columbia County and illustrates some of the pressures faced by communities in the broader Hudson Valley as they attempt to foster new development while also preserving the characteristics of a region known for its small towns and scenic expanses. Town officials in Copake, which includes Craryville, have spent much of the past decade weighing those pressures as they drafted new planning and zoning guidelines aimed in part at reducing sprawl and steering more development to traditional downtowns and hamlets. The town’s new zoning law, finally enacted in July, is getting its first test in the Craryville gas station project. At issue in Craryville is a proposal that actually has been in the works since at least 2016, although it only began to attract widespread public attention this year. The former site of a grocery store at the main intersection of Craryville, N.Y., is the proposed site of a new gas station and convenience store that is testing local zoning. A regional oil and gasoline distributor and retailer, GRJH Inc. of Millerton, is proposing to build a gas station and 3,240-square-foot Cobble Pond Farms convenience store on the vacant lot at the northwest corner of Route 23, county Route 7 and Craryville Road. The station would have three fueling islands, with two dispensers on each side for a total of 12 hoses. Neither the size of the store nor the number of gas pumps is expected to change under the revised proposal to be presented next month, although the configuration of the project would be different and smaller. The company submitted a preliminary proposal two years ago to the town Zoning Board of Appeals, and the board issued a special use permit in late 2016 for a gas station and convenience store at the site. The board also issued a “negative declaration” under the State Environmental Quality Review Act, concluding that the project would not have a significant adverse environmental impact and therefore would not require a more extensive environmental review. With those determinations already made, the town Planning Board began its review of the project earlier this year. In an unusual situation, however, the project received its special use permit under one set of zoning and planning requirements but now is subject to different criteria in the Planning Board review. That’s because Copake adopted a substantially revised zoning code in July. The new code is the result of a long process that began in 2008 with preparation of a new town comprehensive plan. That plan, completed in 2011 after extensive public input, called for preserving certain historic hamlets within the town – including Craryville – by limiting the scale of projects and by attempting to foster pedestrian-scaled development. The comprehensive plan addressed a host of other issues as well, including preservation of the local farming economy, infrastructure and service issues, community and cultural life and protecting environmental and scenic quality. It took seven years, however, for town officials to rewrite the local zoning law to reflect the goals of the comprehensive plan – a process that was only finalized in July when the Town Board formally adopted the new law. As a result, the original proposal for a large gas station in the center of Craryville no longer conforms to the town’s planning guidelines and zoning requirements. Under the revised zoning rules, the new convenience store as originally proposed would be too far from the road and would have too many parking spaces, for example. “We were somewhat blindsided,” said Alicia Metz, president of GRJH Inc. The corporation is a private, family owned company that operates nine service stations in the region. It created the Cobble Pond Farms brand and also licenses it to several other operators of stores the company formerly owned. Craryville is one of several hamlets within the town of Copake. Although it’s in the midst of a scenic area of rolling hills, it’s the kind of place most people drive through without pausing. Once a stop along the railroad line from Chatham to New York City, Craryville sits about three miles west of the center of Hillsdale along Route 23, a busy east-west link between the southern Berkshires, the Taconic State Parkway and the city of Hudson. 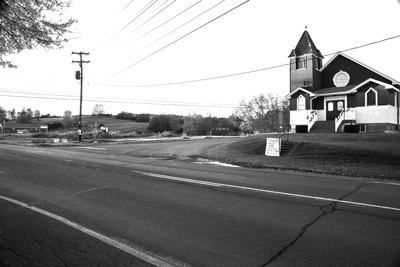 Craryville doesn’t have a traffic light, although the speed limit on Route 23 briefly drops from 55 to 45 mph through the intersection that forms the hamlet’s center. About a mile to the west, a traffic light was installed about 20 years ago when the new Taconic Hills school complex was built along county Route 11A. Like many other towns in the Hudson Valley, Copake (population 3,600) has a mix of longtime residents, newcomers and affluent second-home owners. In a region that has seen an influx of urban transplants over the past two decades, there are the usual contrasts and tensions over gentrification, including rising property values — and complaints that some people who live on local wages are being priced out of the area. The corner lot where GRJH wants to build was once the site of a local grocery store and, before that, a Chevrolet dealership. The center of Craryville also includes a small, modern post office, a Methodist church, and a large former post office building that is currently being converted into a worker-owned store for local foods called Random Harvest (named after a similar store that previously was located there). Just south of the highway sits the barnlike former train station, whose owner hopes to repurpose it as an antique store. Although the railroad has been gone for more than 40 years, supporters hope the Harlem Valley Rail Trail eventually will be extended along the old right-of-way through Craryville. The gas station proposal initially attracted little attention, and the town’s review in 2016 proceeded with little public input or criticism. That changed, though, as neighbors began to learn more about the proposal and began raising concerns about its potential effects on traffic at the busy intersection, which some local people say is already dangerous. In response, Metz’s company commissioned a traffic study that did not recommend any changes. This year, as the town Planning Board moved toward the final stages of reviewing the project, opponents organized an ad-hoc community group, Save Craryville. The group now has a mailing list of about 600 people and has raised funds to print “Save Craryville” lawn signs and to hire a lawyer. Opponents argued that the original proposal is incompatible with the village-like character of the hamlet. In addition to not meeting the new zoning requirements, they say the gas station also raises safety and environmental issues. Several dozen people turned out for last month’s public hearing on the project, and a majority of those who spoke opposed it. The Planning Board agreed to continue its review when it meets Dec. 6. Now, the revised plan is expected to be unveiled at that meeting. Whether that plan will pass muster with the Planning Board – or will satisfy opponents – remains to be seen. The controversy over the Craryville gas station proposal reflects a larger change in philosophy that has been unfolding nationally about the function and goals of local zoning laws. Open-space and smart-growth advocates have argued for years that many local zoning laws, rather than protecting against unwanted development as often promised, actually aided the spread of ugly roadside sprawl throughout the late 20th century by requiring large parking areas, homogeneous spacing of buildings, large setbacks and other unintended consequences. Over the past couple of decades, opponents of sprawl have pushed their communities to update planning and zoning policies to provide more flexibility in placement and density of structures — and to encourage more concentrated development in traditional town centers while protecting open space. This movement was reflected in Copake’s 2011 comprehensive plan, which was based on studies, public hearings and surveys and other input. Among other goals, the plan called for protecting the town’s rural character, traditional identity and historic sites and encouraging farming and environmental protection. It also called for fostering growth in the hamlets that historically had been the town’s population centers. But as more than a few towns have learned, the process of turning the lofty goals of a comprehensive plan into the nitty-gritty details of actual zoning rules can be contentious and difficult. In Copake, that process took seven years. Under Copake’s new law, Craryville is covered by a new hamlet zoning district that’s intended to foster the qualities of walkable villages, including appropriate design and scale of new structures. This includes placing buildings close to the road, rather than at the back of large parking lots, while also allowing room for sidewalks. GRJH’s original proposal was based on the town’s old zoning law, which required more parking and deeper setbacks. And parking was one of the objections raised by Save Craryville. The group has argued that the developer’s plan for 45 parking spaces meant that far too much of the site would be covered with pavement. Metz said her company’s revised plan will be based on the new zoning while also addressing the concerns raised by Save Craryville. So following the formula set by the new law -- 2.75 parking spaces per 1,000 square feet of floor space – the convenience store would need only 12 to 15 parking spaces. In addition, Metz said the layout of the project is being reconfigured to place the store closer to the road. The height of the proposed building has been reduced slightly, she said, and the design will feature a wooden colonial-style facade and vegetation to provide visual screening on the sides of the property. Many of the changes dictated under the new zoning actually make more sense for her company, Metz said. Metz said her company has been working with the town and its residents on a cooperative basis. But she expressed some frustration with what she believes are misinterpretations and mischaracterizations of the project. Metz said she believes the revised plans will be more in tune with the town’s goals for Craryville. “I think this will be a positive and attractive addition to Craryville,” she said. Although opponents of the gas station generally support the town’s new planning and zoning policies, they are less happy with the process the town has followed in reviewing the project. Critics contend the town did not do enough to alert the public about the original proposal. Because many townspeople were unaware of the proposal, they say, the public had little opportunity to weigh in at the early stages of the review on whether a gas station is an appropriate use for a corner lot at the hamlet’s main intersection. Opponents also contend it was inappropriate for the zoning board to be designated to issue a negative declaration under the SEQRA process – a decision that has prevented a more extensive environmental review of the location and the potential impact of the gas station on groundwater pollution, stormwater runoff, traffic safety and other factors. The town Planning Board chairman, Robert Haight, did not respond to messages requesting comment for this story. But at last month’s public hearing on the project, Haight told the crowd that the board has adhered to their responsibility to apply the town’s zoning requirements objectively – and that it will review the project under the new zoning law. He also emphasized that the role of the Planning Board is not to determine whether the gas station is the best use of the property. He and other officials also maintained that the town has met all of the public notification requirements throughout the project’s review. One complicating factor is that Craryville sits at the far northwestern edge of Copake, near the town lines of Hillsdale, Taghkanic and Claverack. So many of opponents who live near the project site are not officially Copake residents. Some in the crowd at last month’s hearing booed when current and former Copake zoning and planning officials pointed that out and said they had no obligation to notify nonresidents about the project. No matter what happens with the gas station project, Carano said the proposal has had a positive effect of bringing people together in the Craryville area. “People here who didn’t know each other have connected with each other, and there’s a stronger sense of community spirit,” she said. She added that Save Craryville is evolving into a permanent organization that is planning other initiatives to protect the hamlet and pursue other projects, such as seeking designation as a historic district.